National Poetry Month each April is the largest literary celebration in the world, with tens of millions of readers, students, K-12 teachers, librarians, booksellers, literary events curators, publishers, bloggers, and poets marking poetry’s important place in our culture and our lives. Download customizable posters for your 2018 One Book One Nebraska event. Available on the 2018 OBON website. This year’s One Book One Nebraska selection offers a great opportunity for participation. 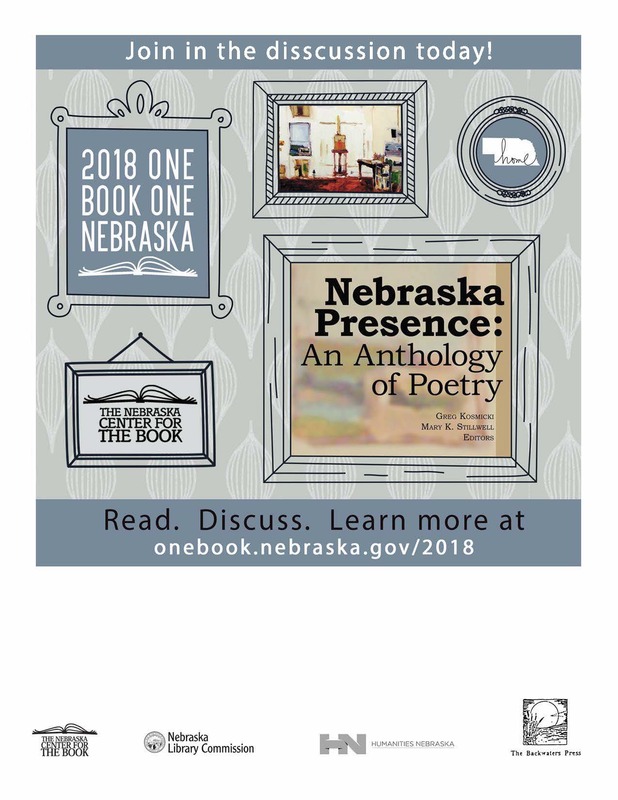 The 2018 One Book One Nebraska: Nebraska Presence: An Anthology of Poetry (The Backwaters Press, 2007) edited by Greg Kosmicki and Mary K. Stillwell includes poems by more than eighty contemporary Nebraska poets, including Pulitzer Prize winner and former Poet Laureate of the United States Ted Kooser, Nebraska State Poet Twyla Hansen, former State Poet William Kloefkorn, and many others. 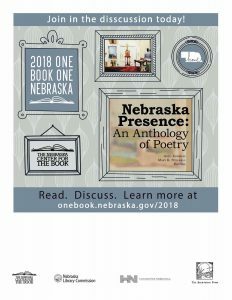 Nebraska libraries are encouraged to organize groups to read the book in your library (book club kits available at http://nlc.nebraska.gov/ref/bookclub/index.asp or from your Regional Library System) and to plan programs to celebrate Nebraska poetry (ideas for programs at http://onebook.nebraska.gov/2018/get-involved.aspx). The One Book One Nebraska reading program, sponsored by the Nebraska Center for the Book, Nebraska Library Commission, and Humanities Nebraska is entering its fourteenth year. It encourages Nebraskans across the state to read and discuss one book, chosen from books written by Nebraska authors or that have a Nebraska theme or setting. Libraries across Nebraska will join other literary and cultural organizations in planning book discussions, activities, and events to encourage Nebraskans to read and discuss this book. Support materials to assist with local reading/discussion activities are available at http://onebook.nebraska.gov. Updates and activity listings will be posted there and on http://www.facebook.com/onebookonenebraska. This entry was posted in Books & Reading, Programming, Public Relations and tagged 2018, 2018 One Book One Nebraska, National Poetry Month, Nebraska, Nebraska Presence: An Anthology of Poetry, OBON, poetry. Bookmark the permalink.